When you have a library of many thousands of pictures, finding the ones you might need is clearly a very important feature. The more quickly you do this, the more time you’ll have left for perfecting them for the print, slideshow, or the other creative stuff. Library Filter panel’s iTunes-style columns are more useful when you’re looking around your catalogue, hacking your way into unknown territory and discovering what’s there. 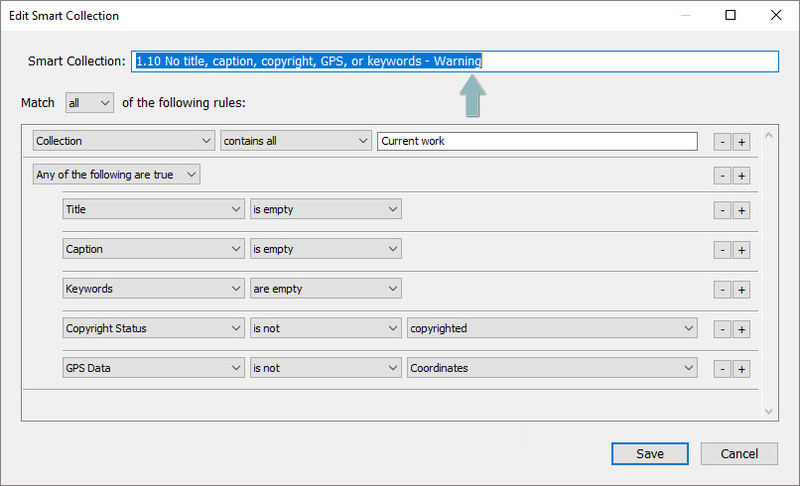 You don’t have a clear aim in mind, and your search criteria are changing as you discover how you previously tagged your pictures (it’s like slicing and dicing with Excel pivot tables or Cognos). But the thing is, I don’t normally need to explore my catalogue – I know, pretty well, what I want to find. So I’ve happily settled down to using Smart Collections almost all the time, and visit the Library Filter panel only for quick filtering by star rating, flag, coloured label, or master/virtual (though more often than not, I’ll apply these quick filters through the Filmstrip). While the Library Filter panel menu does let you save your search criteria as a preset, presets are displayed in a long and unhelpful list. You can easily work with a large number of Smart Collections, group them in multi-level families, and mix them with Dumb Collections too. A filter doesn’t remember any output settings, while a Collection stores the last Print, Slideshow or Web settings applied to it. So the Filter panel is fine for temporary filtering, chopping and changing whatever rating or flag values are visible, while the various types of Collection let you organize, categorize, and group picture. It makes obvious sense to invest time learning their nuances and then applying them as ingeniously as possible. As an example, here’s how I now manage new work. The key is a single Dumb Collection, called “0.00 Current work” into which I drag the pictures I want to process (the 0.00 is there to assist sorting). Then a series of Smart Collections check for images containing “Current work” in the Collection name, and then target more specific criteria. So for example smart collection “1.30 No Captions” checks for pictures that are in “Current work” but where there’s nothing in the caption field. Here it’s zero, so I know I’ve entered captions for every picture. On the other hand, 1.40 No Copyright shows me that for some reason I’ve overlooked two pictures in “Current work”. I can see straight away if there’s any missing metadata in my shoot. You can, to a limited extent, apply the same technique to Develop adjustments too. The caveat is because, unlike Aperture, unfortunately Lightroom still won’t let you target individual adjustments. Imagine how this might have a practical use – a Smart Collection that helps you identify any ISO1000+ images where the Luminance and Color Noise settings are still set to zero. All you can do is what I have done – identify high ISO images and remind yourself that you might want to treat those pictures as a group. That’s how it works. In practice, it’s very simple – after a weekend away, I clear out any existing items from this Collection and drag in the newest pictures. The Smart Collections recalculate automatically and I always can see what’s done and what needs attention. If “Current work” has existing items which still need work, I can move them to another Dumb Collection “Last week’s work” so that my Smart Collections don’t pick them up. Over time I have found it more useful to have fewer smart collections but with more criteria, so this takes the place of 5 different smart collections. Notice too how its name includes the word “Warning”. This is because I have begun using my workflow smart collections in conjunction with the new filter box at the top of the Collections panel. To explain, the above smart collection is one of a very small number of “exception report” smart collections. My practice is that all photos must have these fields completed (that’s just me and your habits may differ) and so this smart collection identifies any pictures which I’ve overlooked. If I’ve entered all the metadata, these smart collections should always show zero. So I am now adding the word Warning to the names of these exception reports. It lets me use the Collections panel’s filter box to show them, and I find this to be a useful way to develop the workflow smart collections idea. If you want to try this out, you can build up such a Smart Collection structure yourself – or save yourself a load of time by saving it from here. Look in the Collections panel, and the workflow smart collections should be there in all their glory. They obviously took me a bit of time to get right, so you can always say “thanks” or “grazie” or “yeah buddy that’s f***ing cool” via my Amazon wish list.